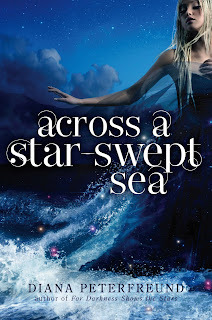 Because Diana Peterfreund's FOR DARKNESS SHOWS THE STARS gave me all the feelings, I was ridiculously excited to delve into the companion novel, ACROSS A STAR-SWEPT SEA. Whereas FDSTS was a retelling of PERSUASION, STAR-SWEPT SEA is a retelling of THE SCARLET PIMPERNEL set in the same world — and both are excellent. I've never read either of the original novels, but from what I gathered from synopsis snooping, Peterfreund's reimaginings stay very true to the plot and tone of the originals, but in an entirely unique world. I highly recommend STAR-SWEPT SEA because, like FDSTS, it's a complex and well-written novel. The characters are flawed and realistic, with conflicting motives and standout personalities. I especially loved the push-pull between Persis and her best friend (and queen! ), Isla, who knows the truth about Persis's alternate identity. Like any quality sci-fi, the book presents multi-faceted ideas on issues of science, politics, war, justice, morality, and equality — but it's never heavy-handed or boring. And though the romance wasn't quite as bosom-clutchingly epic as that in FDSTS (to me, it had swoon but not the SWOON built by years of longing and separation), I loved the relationship between Persis and Justen, and how they had to overcome their prejudices against each other (and their enemy nations). They were a solid couple I really rooted for ... plus, I'm a sucker for secret identities! For readers who are itching for just a glimpse of Elliot, Kai, and the rest of the FDSTS crew, you get that and more! The weaving together of the characters is pretty darn awesome. In particular, I loved the outsiders' view of the FDSTS characters we've grown to know and love. Let me sum up: Adventure, romance, and spies, surrounded by rockstar world-building. Go read this book! Cover talk: I would've liked the badass spy side of Persis to be represented somehow on the cover (since that's what makes her so awesome), but the gorgeous image of her in full socialite getup in a frothy-looking blue dress ACTUALLY EXISTS IN THE BOOK, plus it matches the romantic title. That's a win, to me!